Exotic weapons and armour should be among the most powerful items in Destiny 2 but only if you look after them. In this guide I'll explain exactly how to increase the level of your exotics so they stay in tune with the rest of your evolving gear. Compared to Destiny 1, the sequel is generous in the number of exotic rewards that it gives you. By simply completing the story missions, players will already have amassed an exotic weapon, exotic armour piece and to top it all of, an exotic engram is granted at the end too. The problem with all this generosity is that Bungie had to find a way of stopping these exotics becoming too powerful, too early in the game. For this reason, the exotics drop at a similar Level to your current Power Level. For example, remember when you had the choice to choose between Graviton Lane, Riskrunner or Sunshot? Your Power Level was barely above 150 and these exotics were quickly outmatched by other blue weapons. The same is true for exotic engrams, these are always decoded to a similar level to your current Power Level. Pro tip: do NOT save engrams for later. Their resulting Attack or Defense Level is decided at the time of reward and not at the time of decryption. Infusing is one of the most important tools for keeping your gear up to scratch. It's a way of boosting the level of a particular item, by combining it (fusing it) with another similar item in your inventory. Each time you infuse an item, the sacrificing items Attack or Defense value is used to "pump" up the source item. For example, if you had the Graviton Lance exotic, which is a Pulse Rifle, you could use another Pulse Rifle to infuse into it. The same applies to everything, be it a Helmet, Chest piece, Power Weapons etc. You simply cannot mix and match items when infusing. Note: the Coldheart fusion rifle breaks this rule slightly. Requiring Auto Rifle weapons to infuse. By infusing an item, you can increase the Attack level in the case of weapons, or the Defense level in the case of armour. Things aren't cheap though, and you won't be infusing that often to be honest. The main reason is simply because each Infuse operation requires 4 x Legendary Shards, an end-game currency that comes in short supply. I won't go into too much detail here as you can read more in my other guide about Legendary Shards. The steps to infuse are quite simple, if you know where to look. Of course, it only makes sense to infuse something with a higher Attack or Defense rating, so choosing the item with the highest number from your inventory makes sense. 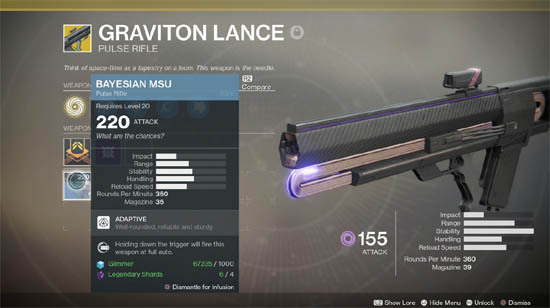 In the above image, a Rare pulse rifle called "Bayesian MSU" is the selected item to be infused into the Graviton Lance. 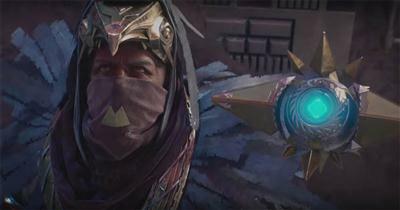 The original exotic has an Attack rating of 155, and the infuse target has an Attack value of 220. After infusion the Graviton Lance's attack value changes to 225. 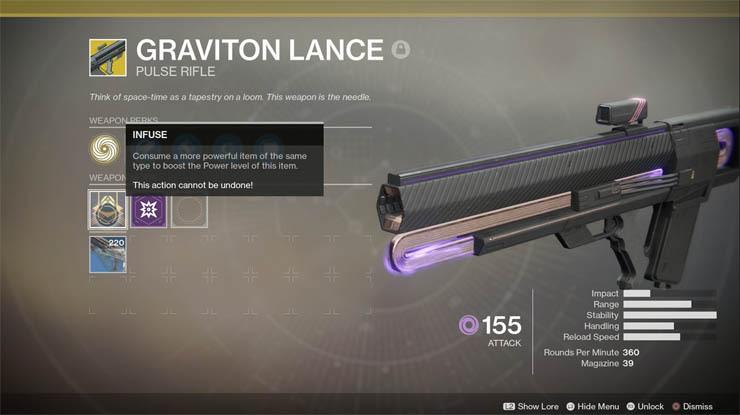 The reason for this value is because the game takes the infused item value, 220 and appends any Weapon Mod's on top, in this case the Graviton has a +5 Attack, resulting in a new Attack value of 225. You can safely assume that when you infuse, the resulting Attack of Defense value will equal whatever you put into the infuse process.